The latest survey of the Social Weather Stations (SWS) shows that while the Aquino administration continues to enjoy high public satisfaction ratings, more Filipinos are dissatisfied with government response on the issue of oil prices. According to the SWS’s Dec. 3-7, 2011 survey, published yesterday (Feb. 13) by the BusinessWorld, the Aquino administration maintained a high 56% net public satisfaction on its general performance. But the administration also posted a negative 3% on its performance on the specific issue of “Ensuring that oil firms don’t take advantage of oil prices”. The negative 3% is 7 percentage points lower than the already low 4% that it recorded in SWS’s previous survey in September 2011. Furthermore, the issue of oil is also just one of two among the 19 specific performance indicators included in the SWS survey wherein the Aquino administration registered a negative net satisfaction rating. The other is “Resolving the Maguindanao massacre case with justice” wherein government recorded a negative 18 percent. 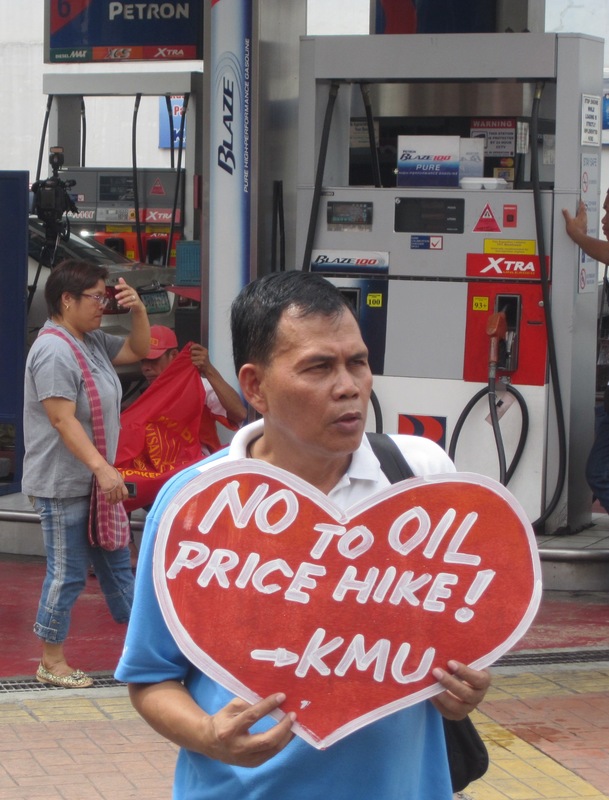 The survey results came out amid fresh rounds of oil price hikes and widespread public perception that oil companies are overpricing their products and accumulating huge amounts of profits at the people’s expense. The SWS findings clearly indicate that the public is not buying the Aquino administration’s response to the problem of high oil prices and overpricing charges against the oil firms. This includes the Pantawid Pasada program and the establishment of a so-called independent panel to review “the books of oil companies to ensure transparency in fuel pricing”. The adverse public opinion against the profit-greedy oil companies and lack of government action against their abuses should compel policy makers to initiate reforms in the downstream oil industry. Unfortunately, it is obvious that the people could not expect President Aquino to instigate this policy shift. Aquino has shown unwillingness to heed the demand to repeal the Oil Deregulation Law (ODL) or Republic Act (RA) 8479 and establish a regime of effective state regulation to “ensure that oil firms don’t take advantage of oil prices”. Aquino has also rejected calls for not just the scrapping of the 12% value-added tax (VAT) on petroleum products but even its suspension to at least mitigate the oil price hikes. But fortunately, some lawmakers have taken notice of the perennial problem of high, escalating, and questionable oil prices and made proposals to look into the ODL and the oil VAT. At the House of Representatives (HoR), for instance, aside from the representatives of progressive partylist groups, legislators from mainstream political parties as well as from moderate partylist groups have also filed bills ranging from amendments of to outright repeal of RA 8479 and suspension or repeal of the VAT on oil. A quick look at the webpage of the HoR’s committee on energy shows at least five (5) bills proposing to repeal RA 8479 and at least two (2) bills and one (1) resolution proposing review and amendments. On top of these, there are also at least five (5) resolutions calling for a probe on oil pricing as well as one (1) resolution seeking emergency powers for the President to address the oil crisis. Aside from proposals on what to do with RA 8479, at least three (3) congressmen have also filed bills removing or at least suspending the VAT on petroleum products. All in all, there are currently 17 bills and resolutions filed in the 15th Congress of the HoR that aim to reduce and/or control high and escalating oil prices. Meanwhile, at the Senate, at least three (3) bills have been filed that propose to amend RA 8479; institute a system of fair fuel pricing; and impose a cap on the profits of the oil companies.